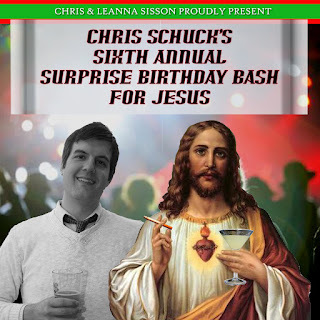 If you've navigated your way to this webpage, then you must have received "Chris Schuck's Sixth Annual Surprise Birthday Bash For Jesus." For those of you new to the mailing list, the birthday bash started out six years ago as the result of my learning how to burn CD's on my new computer as well as my girlfriend (now wife) teaching me how to use Photoshop. In the six years since then it's turned into an audio Christmas card/Best of 200? compilation, which I guess is really just a display of my music geekery/snobbery. So, below you'll find the track listing of the CD (which I'm sure by now you've enjoyed listening to time and time again), some of my very insightful comments, the "Almost Made It List", and the hightly anticipated special holiday message from the Sissons. Please enjoy. 1. Los Campesinos! "You! Me! Dancing!" These seven kids hail from Cardiff, Wales and have been one of this year's internet buzz bands. This song will be on the full length album they are putting out in early 2008 so look out for that. I think in five years I'm going to wonder why I liked this band, but right now I don't see how it is physically possible to disslike You!Me!Dancing!. Ok ok, you got me. Yes, I know Lon Gisland came out in December of 2006. Believe me, I was originally going to give you "Nantes" from Flying Club Cup, but for my money, "Elephant Gun" is the best song I've heard this year. Plus, I noticed that several other music publications were including it on their best of 2007 lists so there you go. If you still have a problem with it, send the CD back to me and you'll get a full refund. 3. Okkervil River "Our Life Is Not a Movie Or Maybe"
This makes two straight very solid albums from these very nice boys from the very nice Austin, TX. I'll bet you wondered if Arcade Fire could possibly top 2004's beautiful Funeral. Wonder no more, this album is fan-freaking-tastic. My favorite song on the album is "No Cars No Go" which was on their self-titled 2002 EP and was re-recorded for Neon Bible. Anyway, in the interest of getting as many tunes as possilbe on the bash, I had to give you the equally excellent "Intervention." As you may know, the absolute zero coolest tour this year was the Arcade Fire/LCD Soundsystem tour. They only played ten or twelve dates and amazingly one of those was at Starlight Theater here in Kansas City! Unfortunately, Leanna came down with a migraine the afternoon of the show, so my friend Jessica and I saw what was in my opinion the hands down best show of the year. If you ever get the chance to see Arcade Fire live, you know, do it. 5. Jason Isbel "Dress Blues"
This is kind of a sad album for me. Jason Isbell was the third guitar player/songwriter for one of my favorite bands, the Drive-By Truckers. This year he left the band to start his solo career. Adam and I caught the Truckers sans Isbel a couple of months ago in Lawrence and they are just not the same without him. On the bright side, Sirens of the Ditch is really good. If you hadn't noticed, "Dress Blues" is about a friend of his who died in Iraq. I have literally teared up more than once listening to that song. This is one of those records that is kind of hard to get into, but when it hooks you, it really hooks you. Here's a tip, turn the volume way up when you listen to it. One of my biggest regrets of the year is not going to see them when they played at Record Bar this summer. I didn't really want to like Graduation. Not because I have any strong personal feelings toward Kanye, but I just don't think he's much of a rapper. As it turns out though, the beats on this record are just what the doctor ordered. I hope you aren't sick of hearing "Stronger." I heard them play it on a top-40 station once so I'm sure they played it once an hour for a few months. In another year of buzz bands, one of the most well-established and, dare I say, revered rock bands in the world created the biggest buzz by selling their new album on their website, charging you the customer a scant whatever you wanted to pat for it! Now I'm not going to tell you how much I shelled out, but I am going to tell you that the record is outstanding. I think at this point, after OK Computer, Kid A, Amnesiac, and Hail to the Thief, Radiohead is in kind of a can do no wrong situation with me so my opinion might be a little skewed, but probably not in this case. I've seen In Rainbows all over the year end lists. "Bodysnatchers" is the most upbeat track, but certainly not the prettiest. 9. Wilco "The Thanks I Get"
Even if you've never heard of Wilco, I'll bet you've heard a couple of songs from Sky Blue Sky on Volkswagen commercials (they sold the rights to six tunes to be used this way) this year. Did Wilco sell out? I don't know. I do know that there is not a single commercial radio station in this country whose format allows them to play this kind of music. Anyway, who cares? Wilco is another one of those can do no wrong bands for me, but I really wasn't all that impressed with this one at first. I thought it was slow and boring, but after several listens it has really grown on me. I got to see them play live twice this summer, once out on Ninth St. in Columbia, and once at the Crossroads venue in Kansas City. Wilco always brings the groceries, and these shows were no exception. The Kansas City show was actually just a few blocks away from the grand opening of the Sprint Center which was an Elton John concert. That was a good night. By the way, "The Thanks I Get" is actually on the Sky Blue Sky bonus EP you can get from http://www.wilcoworld.net/ if you have Sky Blue Sky. 10. Bettye LaVette "Before The Money Came"
What is soul legend Bettye LaVette doing on my list? Well, I probably never would have listened to this CD had I not known that she was backed by, among others, the Drive-By Truckers. She went back to Muscle Shoals to record this one, and Scene of the Crime refers to her 1972 recording, also made in Muscle Shoals that was to be her masterpiece, but was inexplicably shelved by Atlantic Records. Between acts at the Truckers show mentioned above, they played this record in its entirety over the monitors between acts and I was blown away. "Before the Money Came," is the only original song on the CD (the rest are a nice assortment of covers), and is sort a telling of her life story. If I were ranking these albums I think I'd have to put Ga Ga Ga Ga Ga at #1. I've been a huge Spoon fan ever since I heard "The Way We Get By" on a CMJ sampler back in college. Since then they've been getting better and better. All their songs are kind of simple, and I was wondering what I liked about them so much until I heard somebody point out how the band approaches rythym. Every single instrument, including vocals, is used to push the songs forward, which makes for a really nice, toe-tapping groove. 11:11 is the Rhymesayers (super influential independent hip-hop label in Minneapolis) debut from, here it is Jessica, the lone local artist to make the cut. I won't say it was a weak year for local music, but it was definitely a weak year for local music making its way into my ears. Now, having said that, Mac didn't just make the list because he's local, although that did help. I really really like this album. The lyrics are smart, funny, nicely articulated, and filled with both subtle and not so subtle references to Kansas City. But what really impresses me are the beats. At one point on the record, he points out that what we're hearing is not an independent rap beat ("listen to that bass! "), and he's right. There's a lot of different stuff going on with the music, and most of it is good. 13. Black Rebel Motorcycle Club "Took Out A Loan"
Baby 81 makes the list based on the strength of the first three songs on the CD. Maybe I'm crazy, but when I listen to something brand new to me, I always get an intial impression and then hope that the music does something, which almost never happens. (I just read that last sentence back to myself. You guys must think I'm really high right now.) The first three tracks on this one do exactly what I want them to. You know the other thing is, I've always liked BRMC's sound, but thought their songwriting was too boring and didn't really make use of that great sound. They still aren't there in my opinion, but with this record, they're getting close. 14. El-P "Up All Night"
This is by far the most hard to listen to/get in to album on my list. 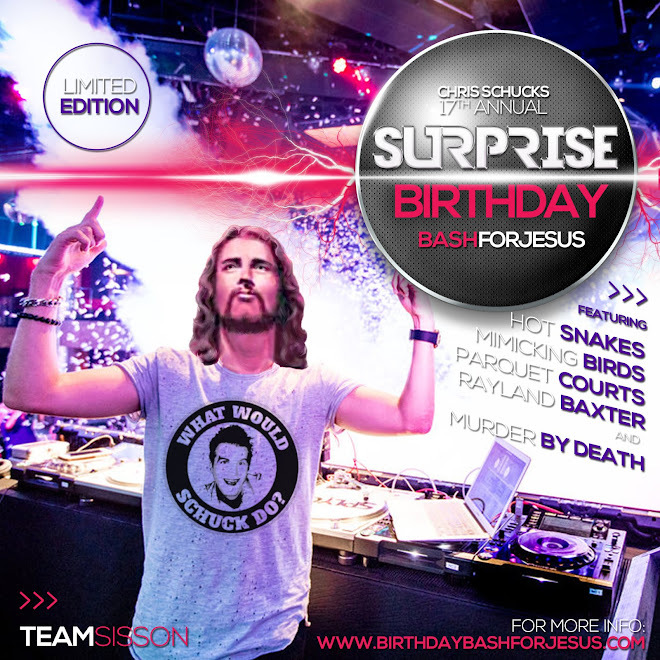 I wouldn't be surprised if not a single Birthday Bash recipient enjoyed the track I've selected or any other on I'll Sleep When You're Dead. I think it came out back in April, and I remember that I loved it right away. Anyway, after maybe July I didn't listen to it at all until I started putting this list together and honestly, at first I had a hard time remembering what I liked about it so much. Then I figured it out that it is just really really freaking good. 15. Flight of the Conchords "Business Time"
Favorite TV show of 2007? Flight of the Conchords! In case you were unaware, Flight of the Conchords are the self-proclaimed "fouth most popular two person novelty band in all of New Zealand." This astonishing level of fame netted them an HBO series that is both built around their songs and hilarious. The Distant Future is just a hastily produced EP (I think the show's success was a little unexpected), but look for a full lenght album to come out next year, as well season two. 16. Lucinda Williams "Come On"
West came out early in the year, and when it did I thought it was really good. Since then I saw her play live (not impressive) and heard a lot of other really good music so I came close to leaving her out. But in the past couple of years I've been criticized for not including enough women in the Bash, so here you go Caryn with a K. Don't get me wrong, it is a very good album, and her live show wasn't that bad either. I was just turned off by the fact that she was reading either music or lyrics out of a three ring binder for most of the show. I think a professional musician should memorize those kinds of things, but who am I to judge. At least it was an outdoor show, and there was a pretty cool electrial storm going on all around us. 17. LCD Soundsystem "All My Friends"
Sound of Silver is probably the consensus album of the year judging by all the lists I'm looking at. I wouldn't put it at #1, but I obviously have put it in my top 17. As I mentioned above, Jessica and I got to see LCD open up for the Arcade Fire at Starlight Theater. There were some sound issues during the first two songs, but from then on they played a killer set, although I think they'd be much better at a venue that wasn't all bolted seats. Yes, "All My Friends" is 7+ minutes of repetitive keyboards, but stick with it. It builds to a great crescendo that I think is just fantastic. I didn't get the early edition of the Bash mailed out until Christmas Eve, so you all will have received it a little later than usual. So, we hope you have/are having/have had a happy and safe holiday season. Much luck in 2008, although with Gary by your side you won't need any. Remember, Gary has a plan for all of us.